What if the Fed Lowers Instead of Hiking Interest Rates! If is not in May it will very likely be in June. When the Fed will finally be forced to be honest and admit that it is wrong on the economy and therefore will have to drop its tighter monetary policy with as consequence that precious metals assets will skyrocket. A U-Turn by the Fed changing their policy direction from tightening to easing will create a massive market shock. That day is rapidly approaching. As Michael Belkin says "financial markets are a case of the blind leading the blind. The Fed keeps talking economic strength and has broadcast a series of interest rate hikes and even balance sheet reductions, those consensus trades have virtually all market participants incorrectly positioned." This is in my point of view because almost everybody got drugged for the last 8 years and thus lost perspective of what is real and what isn't. That the Fed will have to ease instead of tighten is something I and with me several more people have been arguing the last couple of years. As they say when you are too far ahead of foreseeing what will happen you are regarded as a knucklehead whilst if you predict the situation a few weeks before it happens you are viewed as a genius. The reason for a U-Turn is that according to my and other people's perception the economy was and is very weak whilst the Fed is trying to portray, using manipulated economic figures, a strong economy to try and boost consumer confidence hoping the economy will find traction. Though this hope has been in vain and hence the Fed has become a prisoner of its own falsifications and realistically can't increase interest rates and most likely will have to cut interest rates again rocking the investors' community. In my point of view the only Fed statistics that come close to what the real situation on Main Street is are those of the Atlanta Fed. On April 17 the Atlanta and New York Reserve Banks downgraded their outlook for U.S. economic growth for the first quarter after disappointing data on retail sales. The U.S. Commerce Department reported retail sales falling 0.2% in March following a 0.3% decrease in February, which was the first and biggest decline in nearly a year. As a result the Atlanta Fed reduced first-quarter gross domestic product, GDPNow, to 0.5% down from the 0.6% growth rate calculated on April 7. On April 17 the New York Fed also downgraded first-quarter GDP at 2.09% from 2.56% a week earlier (quite a reduction!). The next GDPNow update is Thursday, April 27. Anyway just see on the chart here above how out of whack the forecast of the industry analysts are with GDP forecast for the first quarter of between 1%-2% or between 2x-4x more than the Atlanta Fed is forecasting. Wall Street is always too late in their downgrades because of their positive bias, followed for obvious reasons, Wall Street makes more money with a positive than a negative stance. In my point of view it all is pretty simple. People just simply don't want to further increase their debts in order to buy goods they already have. The numerous vacant stores in New York, even not seen in the 2008/2009 period, are a clear testimony to that. I believe the fact that Ralph Lauren, a popular brand amongst Americans and foreigners, is closing its flagship store on Fifth Avenue is a clear sign of this trend. People are just fully saturated with debt and consumer goods, people are maxed out. No room left! And just recently the BofA in its almighty wisdom "concluded" that surging consumer confidence does not result in higher spending hence why the retail sector is doing so badly. And as we all know consumer-spending accounts for 70% of GDP in the US. Just draw your own conclusion. You can bring a horse to the water but you can't make it drink and especially not when it doesn't trust the wáter! Dallas Fed president still talking about 3 hikes being a good baseline! And despite this all the Dallas Federal Reserve President Robert Kaplan said on Thursday April 20 that two more interest rate hikes this year remains possible but that the U.S. central bank has the flexibility to wait and see how the economy unfolds. "Three rate increases this year...is still a good baseline. If the economy develops a little more slowly, then we can do less than that and if the economy is a little stronger, we can do more than that," Kaplan said in an interview with Bloomberg TV. This guy is living in La La Land. Following the abovementioned GDP figures 2 or 3 further interest rate hikes indicated by the Fed are out of the question in my point of view! The economy just can't take it. And now Goldman Sachs is suddenly starting to get cold feet and in a note released overnight, the firm's chief economist Jan Hatzius says that "we have become a bit less confident about near-term hikes." Is this what they call "hedging" (I am facetious of course)? Anyway we will soon witness what the outcome will be. The next meeting will be May 2-3 followed by a meeting on June 13-14 see dates below. *Meeting associated with a Summary of Economic Projections and a press conference by the Chair. With the diminishing returns from the QEs and ultra low interest rates, an U6 unemployment figure of 22.5% (ShadowStats), a record 95m Americans not in labor force (the number grew 18% since 2009) and according to a recent Bankrate survey of 1,000 adults, 57% of Americans that don't have enough cash to cover a mere $500 unexpected expense, the outlook for the economy is not good to say it at the least. The last time continuing jobless claims, just published, was this low, or 1.979 million, the Nasdaq peaked at the end of the dotcom boom and collapsed over 80% in the next 2 years. One has to wonder that despite a slump in industrial production we had the 'best' continuing jobless claims print since April 2000 tumbling to 1.979 million. You know why in my opinion? Because people are so disillusioned that they have given up looking for jobs, hence why the labor participation rate is at historic lows. Unemployment rate 4.5%! don't make me laugh it is a concoction of that liar in chief Obama. According to a new study from the Census Bureau, roughly one-third of all millennials live at home with their parents and one-fourth of them can't be bothered with enrolling in school or finding a job. Next to the weak fundamentals the markets are very overvalued. The Q or Buffett ratio, standing for the stock market valuation ($22.6trn) divided by the total size of the economy ($18.8trn) puts the Buffett valuation at around 1.2x, meaning the stock market is about 20% pricier than the entire US economy. According to Yale finance professor Robert Shiller the S&P 500 SPX is now trading on a cyclically adjusted price-to-earnings (cape) ratio of 30x, compared to a historic fair value for this measure of about 16x. In other words prices are very lofty and thus very vulnerable to shocks. When the Fed will finally admit to the weakening of the economy thereby frustrating further rate hikes and possibly triggering a rate cut the financial markets and US dollar could end up falling significantly. Though most likely in anticipation the markets will front run the Fed and weaken the US dollar in advance of any announcements by the Fed. Another important factor that could contribute to a much weaker dollar in this respect is the fact that on April 9 net Treasury futures shorts were back to their lowest levels since early December 2016 whilst traders continued to pile into the massively short-end betting on further rate hikes as Eurodollar shorts push on beyond $3 trillion. This is often a contra indicator of how the currency will react when too many positions are taken in one direction. The vulnerability of those trades often rises significantly when positions reach extreme proportions and often result in the opposite outcome because of the need of immediate covering before others do when high expectations are not met in order to limit losses. So instead of being regarded a beacon of strength the US dollar is most likely to lose its luster. I think people start to lose their trust in the financial system and are looking for an asset class which attractiveness stands on its own and is not determined by fake statistics. Although we all know that the Fed, the BIS and the bullion banks have been defending the US dollar by discouraging investors to invest in gold and silver the fundamentals for gold and silver are now catching up (just look at the tug of war in the futures market) and there is no place to hide anymore for the scam artists. And because the central banks will lose their status of lender of last resort because they have undermined the economies and currencies investors will resort to the ultimate lender of last resort: physical gold and silver. The upcoming weakness in the US dollar, which is inversely correlated to gold, will force deliveries of physical gold on the Comex instead of the usual nominal settlements in US dollars which in turn will force the price of gold and silver to multiples of their present value. And the outlook for the US dollar is I believe supported by the charts that are kind of indicating the weakness in the US dollar and the strength of gold and silver. As we can see on the US dollar chart below the 99 level being the 200-day moving average is quite crucial for the direction of the US dollar. And the authorities will do everything to defend that level. Though when the US dollar index convincingly breaches the 99 level, with potentially geopolitical triggers, we most likely will see 92-94 before falling to 70 if and when "justified" by fundamentals and sentiment. When we break crucial levels things will start feeding on themselves. The inverse correlation a result of the gold and silver price being expressed in US dollar is showing a very near break-out (see below). And as charts show the further in time we get the more certain the break-out will be. It is just a matter of time. AISC or All In Sustaining Cash costs for gold are between $1,100 and $1,300. In other words the downside is very limited because below these levels there are not many gold producers that will be profitable. As mentioned here above there is clearly a tug of war going on in the futures market. There are record short positions in the gold and silver markets and especially in silver with the longs not getting flushed out. The number of strong hands, investors that believe in the long-term prospects for gold and silver and are holding on to their positions, are clearly increasing. The Fed and the bullion banks dumped 22,000 futures contracts on Tuesday April 18 just before the London fix, which resulted in a $8, fall of the gold price in order to rise subsequently $15!!! In my point of view this is a clear sign of the increasing demand for gold from investors to hedge themselves against the geopolitical risks, peak markets and an imminent weakening of the US dollar whilst the Fed and bullion banks seemingly are losing their control in depressing the gold and silver prices. This dumping was respectively repeated on April 19 when 20,000 futures contracts were sold. Both dumps had a notional value of between $2.5-$3bn (20,000 x 100 x 1290= $2.58trn). Next to the geopolitical tense situation in North Korea and Syria we have French elections on April 23. On April 25 the anniversary of the Korean People's Army is celebrated with possibly new provocations whilst on April 28 we have the deadline for the US government to pass a new funding bill. Congress is on holiday till April 25 and it's unlikely they will do anything other than pass an "extraordinary funding measures" bill to allow the debt ceiling can to (yet again) be kicked down the road. Anyway a lot of events that could possibly lead to spikes in the equity and bond markets and the US dollar and gold and silver. And then last but not least of course the Fed meeting on May 2-3 which I will follow with great interest. As described in my last article http://www.safehaven.com/article/44172/the-next-crisis-is-the-mother-of-all-counter-party-risks-part-2 the mother of all counter-party risks in the end is the devaluation of your currency, the purchasing power or the real goods you can buy with your nominal money. And the CBs have issued so much money without the expected productivity gain that now the law of dimishing return is having the opposite affect and is undermining the value of the reserve currency. You just have to look at what happened in Japan since 1989. And as we know in 2008 the banks created the crisis now the central banks are creating the crisis by undermining the currencies . Central banks (ECB & BoJ) have bought $1 trillion of financial assets just in the first four months of 2017, which amounts to $3.6 trillion annualized, "the largest CB buying on record." As Hartnett of BoA notes, the "Liquidity Supernova is the best explanation why global stocks & bonds both annualizing double-digit gains YTD despite Trump, Le Pen, China, macro..."
According to the chart here below any time the central bank punch bowl is taken away, an unpleasant "financial event" inevitably happens. We are at the end of a long economic cycle. And the central banks haven't been able to "help us out" we are on our own and therefore preserve your capital by acquiring physical gold and silver, the ultimate lenders of last resort. You can't trust the Fed. The Fed will have to admit defeat and reverse policy and it won't miss its impact on the markets and more importantly the dollar and gold and silver. After seven decades of hegemony in Asia, America now has to accommodate an increasingly powerful China, says Dominic Ziegler. Can Donald Trump’s administration manage that? THE LAST TIME China considered itself as powerful as it does today, Abraham Lincoln was in the White House. At that time, and against the mounting evidence of Western depredations, the emperor still clung to the age-old belief that China ruled all under heaven, a world order unto itself. It never had allies in the Western sense, just nations that paid tribute to it in exchange for trade. Both China and “the outside countries”, he wrote to Lincoln, constitute “one family, without any distinction”. Today, after a century and a half that encompassed Western imperial occupation, republican turmoil, the plunder of warlords, Japanese invasion, civil war, revolutionary upheaval and, more recently, phenomenal economic growth, China has resumed its own sense of being a great power. It has done so in a very different world: one led by America. For three-quarters of a century, America has been the hegemon in East Asia, China’s historical backyard. But now China is indisputably back. New towers have transformed the skylines of even its farthest-flung cities. An ultra-modern network of bullet trains has, in a few short years, shrunk a continent-sized country. China’s new power rests on a 20-fold increase in economic output since the late 1970s, when pragmatic leaders set in train market-led reforms. Over the same period the number of Chinese people living in extreme poverty, as defined by the World Bank, has fallen to 80m, a tenth of what it used to be. 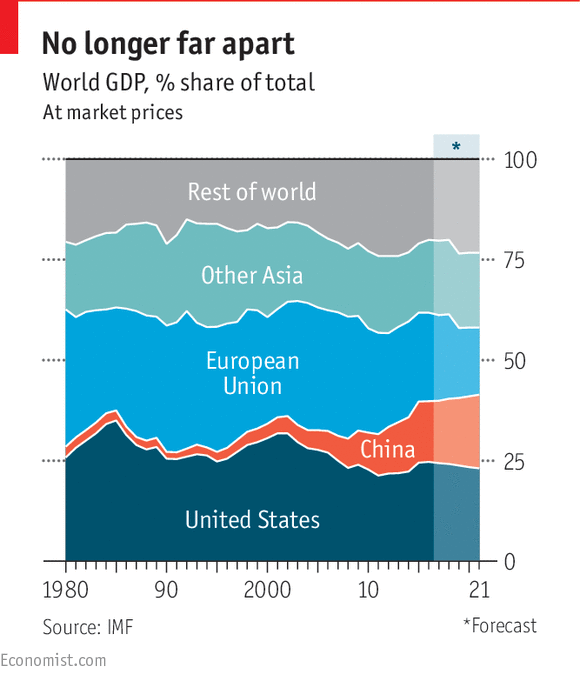 China is the world’s biggest trading nation and its second-biggest economy after America. There is hardly a country in the world to which it does not matter, either as a source of consumer goods or as a destination for commodities, capital goods and investment. 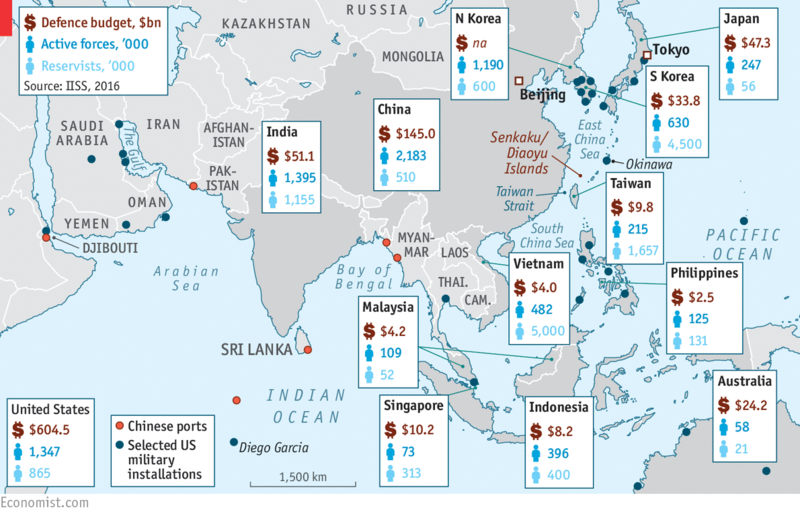 On all these counts, China wants—and deserves—a greater role in East Asia and in the global order. America has to make room for it. But the task will require wisdom and a subtle balance of firmness and finesse on both sides. 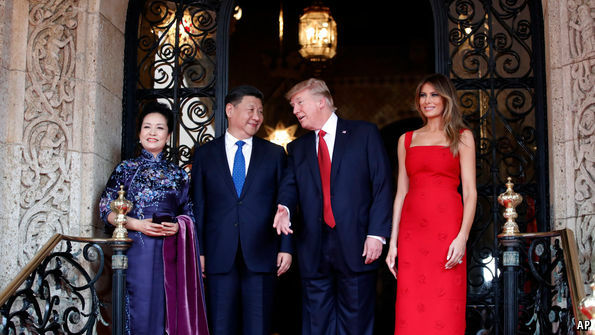 A first indication of what to expect was on display at a summit between Xi Jinping and Donald Trump on April 6th and 7th at Mar-a-Lago, the American president’s Florida golfing resort. Though little of substance was discussed, Mr Trump hailed the bilateral relationship as “outstanding” and Mr Xi declared there were “a thousand reasons to get the China-US relationship right”. Neither mentioned the cruise-missile strike America had just launched against a Syrian air base. Nor was there any talk of imminently imposing tariffs. For all the superficial bonhomie at the summit, the two countries see things very differently. China’s system of politics, both bureaucratic and authoritarian, has helped economic development at home, but is alien to American notions of democracy. American policymakers have traditionally seen liberal democratic values and an emphasis on human rights as factors that legitimise and strengthen the international order. Chinese policymakers see them as Western conspiracies to foster the kind of colour revolutions that brought down authoritarian former Soviet regimes, and might attempt to do the same in China. Chinese strategists consider the country’s rapidly modernising armed forces as essential for protecting the sea lanes on which its prosperity and security depend. They think a powerful navy is needed to keep potential adversaries from China’s shores and stop them from grabbing Chinese-occupied islands. They also suspect that America’s massive military presence in the Asia-Pacific region is designed to check China’s rise. American strategists, by contrast, say their country must keep a presence in the region because Chinese hard power unsettles America’s friends in East and South-East Asia. In the past few years China has challenged Japan over the Japanese-controlled Senkaku Islands (which the Chinese call the Diaoyu Islands), and carried out extensive construction works to build bases and runways on disputed rocks and reefs in the South China Sea. Those American strategists suspect China of wanting to turn the vast sea into a Chinese lake; and, more broadly, of seeking dominance in East Asia and overturning the existing order. America has long sought to prevent any one power having hegemony in Asia, whereas China wants to keep potential adversaries far from its shores. Somehow, they have to find a way of accommodating each other’s overarching goals, as Henry Kissinger explains in his classic book on statecraft, “World Order”. Peace hangs on the outcome. That peace cannot be taken for granted. In much of East Asia, history is unfinished business. Taiwan, to which the Nationalist losers in China’s civil war fled in 1949, is a thriving and peaceful democracy. Yet China’s Communist Party sees its sacred mission as bringing Taiwan back into the motherland’s fold, and reserves the right to use force to do so. American guardianship of the island is meant to ensure that China never dares. But as Chinese might grows and American commitment appears to wane, the room for miscalculation grows. Soon after his election Mr Trump even seemed to be calling into question America’s endorsement of the “one-China policy”—China’s insistence on the polite fiction that Taiwan is part of China. A potentially more imminent flashpoint in the region is the Korean peninsula, divided since the end of the second world war. North Korea, ruled by a family mafia now in its third generation, has a broken economy and an ill-trained army. But it has poured money into nuclear programmes that threaten South Korea, unnerve Japan and before long will also pose a threat to America. North Korea exasperates China’s leaders, yet they feel they must show solidarity to a former ally against America in the bloody war North Korea launched in 1950. China would rather have a nuclear North Korea under Kim Jong Un than a failed state sending millions of desperate refugees across the Chinese border. Above all, it is troubled by the idea of a unified, democratic Korea with American troops next door. At Mar-a-Lago, Mr Trump asked Mr Xi for ideas to deal with the threat from North Korea, but his missile strike in Syria made it clear that America might act alone against the North. Handling Mr Kim’s belligerence—and the regime’s eventual demise—will be a huge test of great-power co-operation. Yet conflict between China and America is not inevitable. Both sides want to avoid it and can adjust accordingly. It helps that habits of co-operation have become established over four decades of Chinese market reforms, which could not have happened without American security guaranteeing China’s external environment. Theirs is the world’s most important bilateral economic relationship today, with combined annual trade adding up to $600bn and investment in each other’s economies totalling around $350bn. China has no missionary zeal or ambitions to export revolution, nor indeed any grave ideological misgivings about the current order, which it resents chiefly because it does not have a greater say in running it. Ensuring more of a role appears to be the chief mission of Mr Xi, China’s paramount leader since 2012. He has accrued more authority to himself than any leader since the late Deng Xiaoping, and is now gingerly putting forward a model for greater global leadership which party theorists are starting to call the “China solution”. At one level, this is about practical matters, such as investing in Central Asia to reduce poverty. At another, it is about opposing American dominance. China, Mr Xi told a conference in February, should “guide international security” towards a “more just and rational new world order”. That kind of language is redolent of the old imperial Chinese virtues. But whereas China’s previous experience of power was of ruling all under heaven, it now has to accept being merely one great power among several. America, for its part, has never had any experience of ceding as much influence and authority as it may have to do to China in future. Mr Trump’s victory came as a huge shock to China’s leaders. They hate unpredictability and would have much preferred Hillary Clinton, the devil they knew. It also came at an inconvenient time for the Chinese. Mr Xi is focusing on a crucial five-yearly Communist Party congress later this year. He appears set on consolidating his grip on power, against a backdrop of an unsettling credit bubble and economic growth that has slowed sharply from a peak of 10% a year to just 6.5%. For the most part, China has concealed its alarm over Mr Trump behind studied caution. “When you see 10,000 changes around you,” Chinese leaders told Kevin Rudd, an Australian former prime minister and China hand, citing one of their language’s countless proverbs, “ensure you yourself don’t change.” China’s leaders have decided to wait and see. But behind the scenes they have been trying hard to influence Mr Trump, working mainly through his son-in-law, Jared Kushner, a property developer with Chinese ties. The Chinese also soon grasped the new president’s transactional approach, prompting them to dispatch Jack Ma, the boss of Alibaba, an e-commerce giant, to meet him. He promised that his firm would generate 1m jobs in America. Soon afterwards trademark applications to protect the Trump brand in China that had languished in the courts for years were suddenly granted. Cause and effect are impossible to disentangle, but Mr Trump has certainly toned down his pre-election anti-China rhetoric. Yet deep, abiding uncertainties about the two countries’ relationship remain, not least over trade, which for three decades has underpinned relations between the two countries. 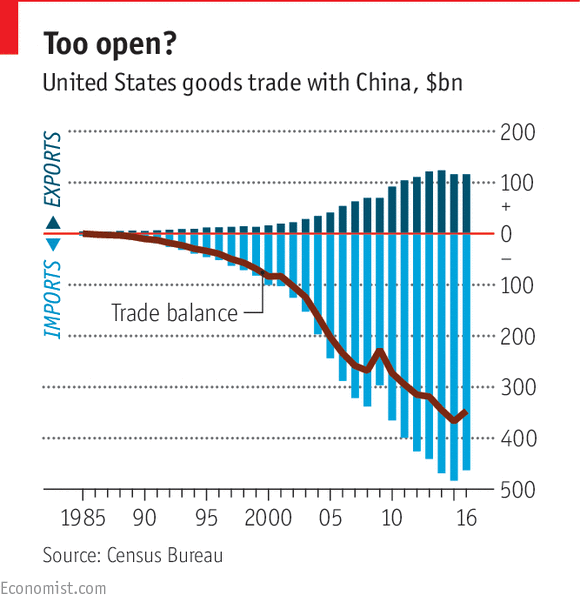 Mr Trump appears to view trade not as mutually beneficial to all parties but as a zero-sum game, and gives short shrift to the post-war multilateral trading system. One of the first things he did after coming to office was to cancel the Trans-Pacific Partnership (TPP), a free-trade agreement among 12 countries in the Asia-Pacific region (though not China)—a big blow to America’s economic role in Asia. More broadly, the world view of some of Mr Trump’s advisers encompasses a Manichean expectation of conflict. They claim that China is so set on strategic rivalry with America that military conflict is inevitable, and argue that the best way to protect the national interest is to spend more money on the armed forces and less on diplomacy. Such people do not have a monopoly on the internal debate about America’s strategic relationship with China, any more than they do on trade. As this special report went to press, an alternative approach to trade, involving a robust multilateralism, was gaining favour. Meanwhile James Mattis, the defence secretary, on his first trip to Asia in early February urged care when challenging Chinese construction in the South China Sea with military force, and emphasised the primacy of diplomacy over military action in resolving differences. Mr Mattis, a well-rounded former general, is what Washington’s seasoned hands call one of the administration’s “grown-ups”, but there are precious few of them. The secretary of state, Rex Tillerson, a former oil boss, was counted among them, though question marks have since been raised about his Asia diplomacy. And although every new administration takes time to fill vacant posts, the gaps in the Trump foreign-policy team, especially on the Asia desks, are alarming. Among other things, almost all the Republican party’s seasoned Asia hands, who during the Obama years were working in think-tanks, universities or the private sector, swore before the election that they would never serve under a President Trump. Some have since swallowed their pride and moved closer to the new administration, but Mr Trump’s henchmen have long memories when it comes to criticism of their boss. Amid all this uncertainty about Mr Trump’s policy in Asia, the two chief risks for the region appear almost contradictory. The first is that, after an initial honeymoon with Chinese leaders, an increasingly aggressive stand by the new administration raises Chinese hackles while failing to reassure America’s Asian friends. The second is that American policy in Asia becomes half-hearted and disengaged, again unsettling Asian friends and perhaps emboldening China. The consequences in either case might be similar—shifting power dynamics that require rapid adjustments, risking instability and even regional turmoil. Hope for the best, but prepare for disorder under heaven. It is arguably the largest economic transformation in recorded history. Can our politics adapt? I am a historian, and that usually means I’m a killjoy. When people say we’re at a unique moment in history, the historian’s job is to put things in perspective by pointing out that there is more continuity than discontinuity, that we are not special, that we think our moment is unique because we are narcissists and we’re at this moment. But what we are going through now—the past 20 or 30 years, and the next 20 or 30 years—really is historically unique. It is arguably the largest economic disruption in recorded human history. And our politics are not yet up to the challenge. What it really means is that jobs are no longer permanent. It used to be that you did whatever your parents and grandparents had done. Hunter-gatherers and farmers never even thought about it. There was no such thing as job choice, only becoming 7 and 10 and 12 years old and taking on more responsibilities to earn your keep. Industrialization brought a massive disruption. At the end of the Civil War, 86% of Americans still worked on the farm. By the end of World War II, 80 years later, 60% of Americans lived in cities. One of the most disruptive times in American history was the Progressive Era. And what was Progressivism? Not much more than the response of trying to remake society in an era of mass immigration, industrialization and rising cities. But it turned out not to be as disruptive as people feared, because once you got to the city, you got a new job, which you’d probably have until death or retirement. And the social capital that used to be in the village tended to be replicated in urban ethnic neighborhoods. What’s happening now is wholly different. The rise of suburbia and exurbia, and the hollowing out of mediating institutions, is an echo of the changing nature of work. 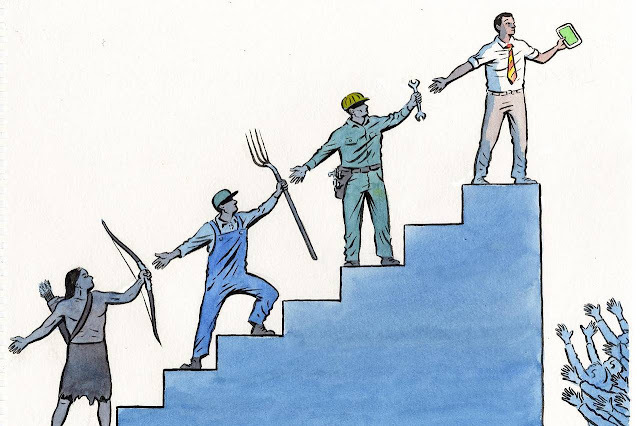 In the 1970s, it was common for a primary breadwinner to spend his career at one company, but now workers switch jobs and industries at a more rapid pace. We are entering an era in which we’re going to have to create a society of lifelong learners. We’re going to have to create a culture in which people in their 40s and 50s, who see their industry disintermediated and their jobs evaporate, get retrained and have the will and the chutzpah and the tools and the social network to get another job. Right now that doesn’t happen enough. Think about qualitative survey data—polls that ask, “What are the top three or four things you’re worried about?” Ten years ago, nowhere on the top 10 of that list was anything about prescription drugs. Today opioids are a major concern. People are scared about drug abuse in largely middle-aged populations. That’s a symptom of the economic disruption. I don’t mean to be exceedingly pessimistic. There are plenty of wonderful opportunities for American families and innovators in this new economy. For one thing, there are fewer middlemen complicating transactions instead of adding value. So we’re going to get a lot more visibility and transparency into product offerings, and consumers are going to get higher-quality and lower-cost stuff. In other industries, we don’t know how to price for things that turn out to matter quite a lot. Think of the news media. We are going from a world in which we had too much central control by a few large organizations, to one in which everybody, everywhere can deluge us with information. What is likely to happen next is not a lot more higher-quality journalism. We’re going to have higher-volume journalism, and some of it will be good. A free, thriving, and independent press is critical to self-government, so this is a big challenge. But people are also able to silo themselves into an echo chamber, where they hear only things that they already agree with. More conspiracy theories come to flower than ever before. You can see it on our college campuses, where students don’t want to encounter any new idea without a trigger warning. If you’re never going to encounter ideas that you didn’t already know and affirm, I don’t know why your parents are paying tuition, because education is all about wrestling with new ideas. The political result is not just polarization, which is a big problem, but political disengagement. If you think that the biggest problem in America is the other political party and that your party has all the answers, if only you could vanquish the other team from the field, I’ve got a lot of people I’d like to introduce you to—because Washington doesn’t have very good answers right now. With the magnitude of the challenges we face in this moment of disruption, it isn’t the case that one side is right and the other side is standing in the way, or that one side is enlightened and the other side is retrograde. It’s that we don’t have any of the right policy conversations. Most of the really big challenges of this moment are not easily reducible to core Republican or Democratic platform positions. For one thing, we don’t have a national-security strategy for the age of cyberwarfare and jihad. Since the 1640s and the Treaty of Westphalia, we’ve had a view of geopolitics and national security that is about state actors. There are lots of state-actor problems out there, including Russia and China. But of the 200 or so countries in the world, only about two-thirds really control all their territory. The rest are more like Afghanistan, Syria or Libya. There may be some entity that has more power than anyone else—think of the Taliban on the eve of 9/11. But we weren’t attacked by the Taliban; we were attacked by al Qaeda, which exploited the vacuums of ungoverned spaces in the territorial borders of Afghanistan. A lot of the dangers and the threats we face are from jihadi-motivated people who are going to self-radicalize in place and create their own terror networks. We also lack seriousness about tackling the entitlement crisis. The Republican Party appears almost as indifferent as the Democrats to telling the truth about entitlements. People talk about the national debt, which is approaching $20 trillion. But that’s just the total of intergovernmental transfers and publicly held bond debt. The number that matters is the unfunded obligations of the U.S. government, including future Social Security and Medicare payments. It’s more like $65 trillion to $75 trillion. And what about the policy implications of the economic disruption? The cultural, societal, familial and social-network responses to a world of lifelong learning and job disruption are far more important. But there are many potential policy responses in education and job retraining. Are any of these conversations on our national agenda right now? What will the American idea look like when we get to this new, disrupted world of the digital economy? What will entrepreneurship look like? What will cultural pluralism and a robust defense of the First Amendment look like? What will it mean to be able to say that the meaning of America is still centered in institutions that look like the Rotary Club—where people actually live, where they know and love their neighbors, and where they actually want to do good, not just wear tribal labels about some distant fight in Washington that isn’t anywhere near up to the task of the moment we face? That’s the challenge before us, and here’s the good news: Throughout our history Americans have been optimists, ready to seize the day. Let’s get to work. Mr. Sasse, a Republican, is a U.S. senator from Nebraska. This is adapted form a speech he delivered to Colorado’s Steamboat Institute. The two countries need each other, but their interests are diverging. 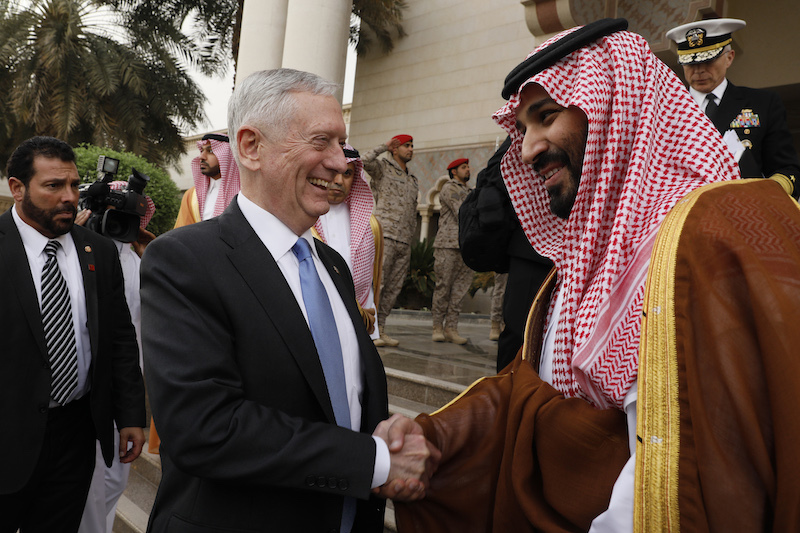 On April 18, U.S. Defense Secretary James Mattis paid a two-day visit to the Saudi capital as part of a weeklong regional tour. At a press conference, the former senior American commander said that the kingdom is “stepping up to its regional leadership role.” Mattis also referred to Saudi Arabia as the United States’ best counterterrorism partner. Mattis’ warm words require some explanation because U.S.-Saudi relations have been on the decline for over a decade. Historically, the United States has treated Saudi Arabia as a close ally, despite the massive difference in values between the two countries. But the relationship was damaged by the 9/11 attacks, which were carried out by a group that shares the same core Salafist ideology as Saudi Arabia. The 2003 decision by the administration of President George W. Bush to carry out regime change in Iraq, which empowered pro-Iranian Shiite forces in the country, further strained relations between the U.S. and Saudi Arabia. The split was deepened further by the decision of President Barack Obama’s administration to sign a nuclear agreement with Iran in 2015. The deal gave the U.S. a potent ally in the fight against the Islamic State but has energized Tehran at a time when Riyadh’s fortunes are declining. This more recent trend is in sharp contrast to the two countries’ relationship since the famous 1945 meeting between the modern Saudi polity’s founder, King Abdulaziz bin Abdulrahman al-Saud, and then-U.S. President Franklin D. Roosevelt aboard the USS Quincy in Great Bitter Lake in Egypt. In the aftermath of World War II, the United States took over as the Middle East’s great power patron. Previously, Great Britain served in this role. The British had a very close relationship with King Abdulaziz during the first three decades of the 20th century. During this time, the latter led a band of tribal religious warriors who conquered much of the Arabian Peninsula and, in 1932, founded the Kingdom of Saudi Arabia. The Saudis relied on the British as their security guarantor, especially in the days before the monarchy could profit from the export of crude oil, which was discovered in 1938. It was only natural for the Saudis to embrace the Americans when the United States emerged as the leader of the Western world. From the U.S. point of view, the Soviet Union had gone from being an ally in World War II to America’s biggest adversary. Washington pursued a containment strategy against the Soviets. This strategy required allies, especially in the Middle East where the Kremlin also sought alignment with left-wing Arab forces whose fortunes were rising at the time. Saudi Arabia, with its ultraconservative religious monarchy, was a natural ally in the American effort to counter pro-Soviet secular regimes that emerged in many Arab countries including Egypt, Syria, Iraq, Libya, Algeria and South Yemen, as well as the biggest Arab non-state actor at the time, the Palestine Liberation Organization. As a result, the Saudi regime – in addition to the other Arab monarchies (especially in the Persian Gulf) as well as Turkey and Iran – became a close ally of the U.S.-led Western camp. Ironically, in an effort to counter the Soviet Union and its secular proxies, the United States empowered Islamist actors. The U.S.-Saudi relationship further strengthened when anti-American Shiite Islamists overthrew the monarchy in Iran in the 1979 revolution. But nowhere was the American-Saudi alliance against communism more significant than in Afghanistan in the 1980s. The U.S. and Saudi Arabia, in cooperation with an Islamist military regime in Pakistan, backed religious insurgents against Soviet troops supporting the communist Afghan regime. The Saudis spent billions of petrodollars to help the United States during the Cold War. In return, the United States remained the primary guarantor of the kingdom’s stability. In those days, the U.S. overlooked the undemocratic nature of the Saudi regime and its deeply austere Salafist ideology. The U.S. deployed 500,000 troops to protect the Saudis after Iraq invaded and annexed Kuwait in 1990, leading to the Gulf War in 1991. That year was a major turning point. The Soviet Union imploded, ending the Cold War. At about the same time, a global jihadist movement in the form of al-Qaida emerged as a threat to American global interests. As we showed in our recent Deep Dive, transnational jihadism was the natural outgrowth of Salafism, which had its roots in Saudi Arabia. Transnational jihadism was further empowered by the U.S.’ need for radical Islamist militiamen to fight the Soviets and their communist allies. Therefore, the United States ignored the organic links between the Saudi regime and jihadists for another decade. Al-Qaida designed the 9/11 attacks to break the U.S.-Saudi alliance. The jihadist movement did not succeed in this goal, but the attacks weakened the U.S.-Saudi bond. A major divergence between U.S. and Saudi interests emerged. It gradually became clear to the Americans that simultaneously fighting jihadists and maintaining ties with Saudi Arabia was not possible. The jihadists are not allies of the Saudi regime; more than anything, they want to topple it. However, given the overlap in the identity and ideology of jihadists and the Saudi kingdom, Riyadh is unable to counter the transnational movement. The Saudis cannot change their Salafist nature, and fighting jihadism could weaken the Saudi regime. Since Washington needed a partner in this fight, it entered into a complicated but cooperative relationship with Riyadh’s major nemesis, Tehran. 2011 was another watershed year. The United States pulled its forces out of Iraq, leaving the country in the Iranian orbit. By that time, the Arab Spring was a year old and had begun to hollow out the Arab world. The only major Arab state unaffected by the Arab Spring is Saudi Arabia, which has been forced to deal with the regional mess. Making matters worse was the 2014 plunge in oil prices, which badly wounded the Saudis. Even though their interests have diverged, Washington still needs Riyadh because of the U.S. balance of power strategy. The United States does not want to see Iran take advantage of the chaos in the Arab world and accumulate a disproportionate amount of influence. Toward this end, the Americans are also leaning on Turkey to assume a more prominent regional role, especially in the fight against the Islamic State. Turkey is the region’s natural leader, but because of its domestic issues, the Turks are not in a position to intervene at this time. This means that the Americans need the Saudis – even though Riyadh cannot ensure its own security and is working closely with the Pakistanis to get the Islamic Military Alliance off the ground. At the very least, the United States does not want to see the Saudis weakened. This would create more room for not only Iran but also IS. It is this fear that now forms the basis for the U.S.-Saudi partnership.